Since the summer of 2017 we have operated an CO2 exchange and fill program here at KJ Urban Winery. Until then there were few options for getting a CO2 tank filled, our goal is to make the process as easy and affordable as possible. We are partnering with a local Guelph company called Draftcraft. They specialize in just about everything draft related; whether it be line cleaning or a professional draft system installation – they have you covered. We could not be happier to be working with professionals like this. 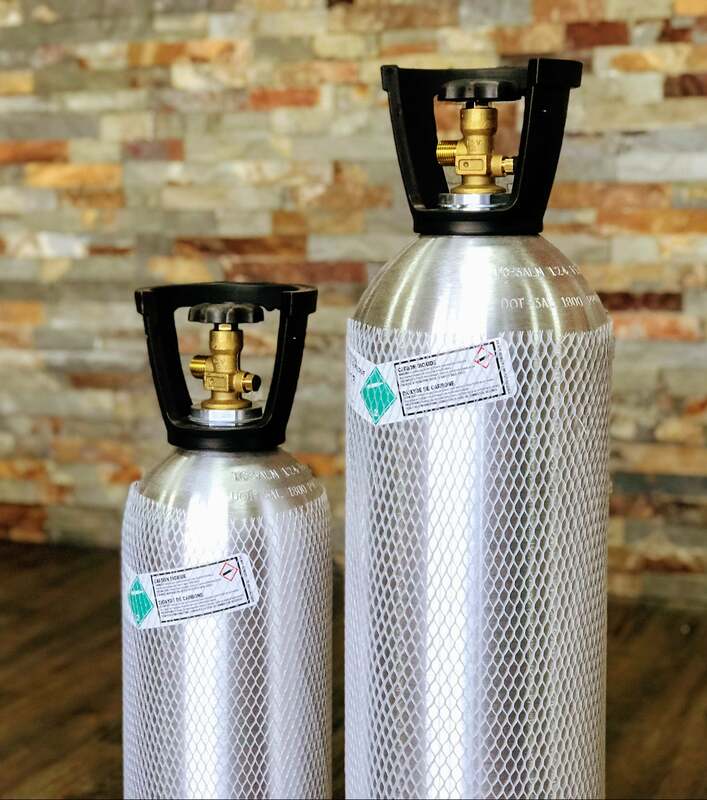 Starting April 2019 we have expanded our gas options to include Nitrogen and Beer Gas! Check below for more details. How to Get into the Exchange Program? There are a few ways to get into the exchange program. The first way is to simply buy a new, filled CO2 tank from us and you are automatically entered into the program. There are no re-certification fees, just the cost of exchanging your tank each time it is empty. Alternatively, if you already own a CO2 tank and want to join the program, all that is needed is to pay a one time buy in fee of $25. This enters you into the program for life. This fee is for tanks of all sizes. What is the Turnaround Time on an Exchange? If you are doing an exchange, we can swap out tanks instantly. We have a large number of tanks on hand in the store in all sizes! If you’re having your tank re-filled without using the exchange program it will take up-to 2 days to have it filled. Yes, we charge a one time $25 buy-in fee for any tanks that are brought into our program. The reason for this is that we re-certify every “foreign” tank to ensure they meet our safety standards. Even if the tank looks great, we just want to be sure that it is fully certified before we add it to our program. Certification costs us $25, we’re merely just covering our bases so everyone in the program is getting professional filled tanks that are officially certified. Alternatively, if you buy a tank outright from us you are automatically entered into our program with no buy-in fee needed! Can I Just Get My Tank Filled Instead of Joining the Exchange Program? Of course! We are able to have tanks filled. There is a 2 day turnaround time for this service. In this instance there is no ‘buy in’ fee, though we will only fill tanks that are within 4 years and 9 months of their last inspection date. If a tank is out of the date range then we can have it re-certified for an extra $25. The price for having a tank filled is the same as having one exchanged. We also fill stainless steel tanks, as well as ones that are painted. Can You Have My Tank Re-Certified? Yes! We can have your tank re-certified for $25. It typically takes about 5 days to have it completed. Mind you, this is the same price as the buy-in and you can have a new, filled tank within minutes. Are There Any Limitations on the Kind of CO2 Tank That Can Be Exchanged? We do have a couple of limitations for the program. We can only accept aluminum tanks, stainless steel tanks are not accepted. Starting April 2019 we have brand new 5Lb tanks for sale of both Nitrogen and Beer Gas. We can also fill existing Nitrogen and Beer Gas tanks. If you purchase a tank from us, we will also be able to exchange it with another new tank when it runs empty. For safety reasons we don’t offer exchanges on existing Nitrogen or Beer Gas tanks (unless purchased from us). We will re-fill existing Nitrogen or Beer Gas tanks with a 2 business day turnaround time. What is the Pricing for Nitrogen or Beer Gas? Will You Be Selling this On Your Online Store? Unfortunately we will be unable to offer filled CO2 tanks on our online shop. Shipping filled CO2 tanks is next to impossible to do both safely, and at a reasonable price. We will be adding empty CO2 tanks to our online shop in the coming weeks and months, and those can always be brought in to be filled or exchanged as part of the program.